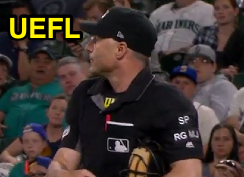 HP Umpire Dan Iassogna ejected Mariners 1B Danny Valencia (strike two call) in the bottom of the 8th inning of the Twins-Mariners game. * With two out and none on, Valencia took a 1-1 curveball from Twins pitcher Taylor Rogers for a called second strike before grounding out on the following pitch. Replays indicate the pitch was located over the heart of home plate and below the midpoint (px -.168, pz 3.349 [sz_top 3.467]), the call was correct. At the time of the ejection, the Twins were leading, 5-4. The Mariners ultimately won the contest, 6-5. This is Dan Iassogna (58)'s first ejection of the 2017 MLB regular season. Dan Iassogna now has 1 point in the UEFL Standings (-3 Previous + 2 MLB + 2 Correct Call = 1). Crew Chief Brian Gorman now has 0 points in Crew Division (-1 Previous + 1 Correct Call = 0). *This ejection was gleaned from UEFL Rule 7-2, which holds that if the official box score is erroneous, "clear and convincing" evidence may override this. In this situation, video evidence of an ejection was used to override a box score that failed to list the ejection. This is the 61st ejection report of 2017. This is the 24th player ejection of 2017. Prior to ejection, Valencia was 0-4 (2 SO) in the contest. This is Seattle's 3rd ejection of 2017, 2nd in the AL West (OAK 4; SEA 3; TEX 2; HOU, LAA 0). This is Danny Valencia's first ejection since Sept 20, 2016 (Marty Foster; QOC = N [Balls/Strikes]). This is Dan Iassogna's first ejection since Sept 25, 2016 (Cameron Maybin; QOC = Y [Balls/Strikes]). Wrap: Minnesota Twins vs. Seattle Mariners, 6/7/17 | Video via "Read More"